Emily Winfield Martin is a person after my own heart. I have to say that until I got my hands on the baby milestone cards that I was unfamiliar with her works, but I quickly fell in love. The milestone cards arrived just in time for friends to have their first little one and I knew they were absolutely perfect for a gift. We also got 2 baby outfits and a rattle to review and those have been gifted as well. Our little guy was just too chunky for them, but I knew that Finn & Emma does not make things cheaply and the design on the little clothing and the type of rattle was perfect. The Emily Winfield Martin Collection is available for purchase from Finn & Emma and is priced just right for someone looking for the perfect baby shower gift. What we got the most enjoyment out of from Emily Winfield Martin were her amazing books. The art in these children’s books is mind blowing. The quality makes you feel like you can reach out and touch everything in the pictures. I love the use of non-traditional art which had Jack wanting more and more. We read all of the short stories in 1 night. The “chapter book” as Jack called it is being saved for a little later when we can sit down more and enjoy it together. These stories and many others have art that can be purchased on the Emily Winfield Martin website and I can think of so many areas that these photos would add beauty to your home, especially a nursery for bringing home baby. 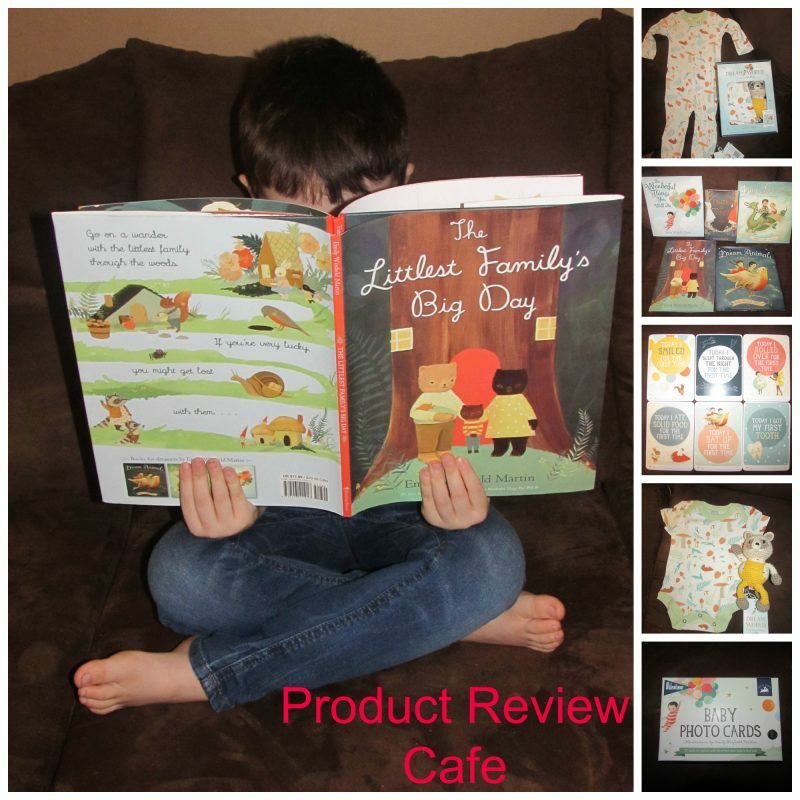 Jack loves The Littlest Family’s Big Day as pictured above and says it is his favorite book to read. I love that I was able to catch such a candid photo of him reading his book and enjoying every single second of it. Thank you Emily Winfield Martin for the amazing books, clothing and baby products. These are sure to be a staple baby shower gift for us in the future and these books will be treasured in our home for many years to come!